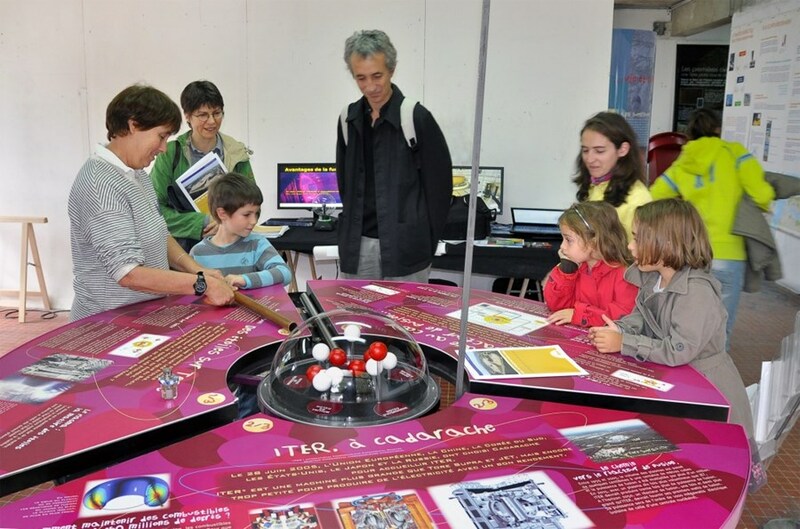 Personnel from CEA's Research Institute for Magnetic Fusion (IRFM), Agence Iter France and the ITER Organization participated in the Fête de la Science in Aix-en-Provence. The annual Science Festival (Fête de la Science) was established in 1991 on the initiative of the then-Minister of Research who considered it important to "take the scientists out of the Ivory Towers of their laboratories and institutions" and engage in a dialogue with the general public. Twenty-one years later, the Fête de la Science has become a national event that involves millions of participants (close to 100,000 last year in the PACA region alone). Throughout the country, tent villages (Villages des Sciences) are set up in public squares where scientists perform "fun physics" experiments; large scientific projects present their progress in an entertaining and easily accessible fashion; conferences and exhibits are organized that aim to communicate the thrill and excitement of scientific research. As they did last year in Marseille, personnel from CEA's Research Institute for Magnetic Fusion (IRFM), Agence Iter France and the ITER Organization participated in the event (in Aix-en-Provence this year), presenting the challenges of harnessing fusion energy and answering the many questions of an ever-curious and often fascinated public.